Blackboard chalk... it doesn't get any more Old School than this, but thanks to the efforts of Nihon Rikagaku Industry Co., everything old is new again. 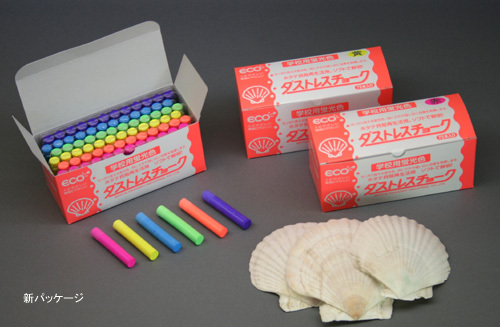 By mixing finely ground waste scallop shells into their chalk matrix, Nihon Rikagaku has come up with chalk that offers brighter colors and less dust - the latter an important consideration for today's computer-equipped classrooms. Factory head Kazuhito Nishikawa has been fine-tuning the formulation of the shell-enriched chalk for some time now. Initial 60/40 shell-to-chalk mixes resulted in chalk sticks that crumbled easily, but when the scallop shell powder was reduced to 10 percent of the mix the chalk stayed together. Says Nishikawa, "At that ratio, crystals in the shell powder act as a cement holding the chalk together." Scallop shells discarded by Japan's seafood processors used to be dumped at the rate of 190,000 tons each year. 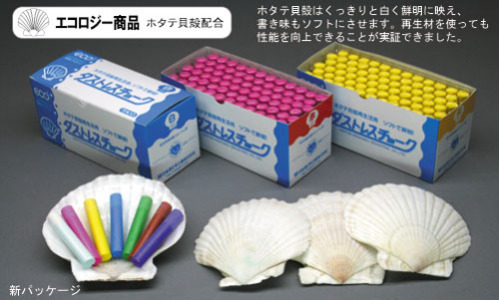 With the encouragement of the government-run Hokkaido Research Organization, Nihon Rikagaku set up a dedicated production line at its factory in Bibai, a major scallop production center.